Thegreattrainrobbery.org - Methods for Reducing Traffic Congestion in Dane County - suggestions adapted from the Book, The road more traveled. suggestions adapted from the Book, The road more traveled. Use measurable data such as "rush hour travel time will only be 15% higher than free flowing times", as they are doing in Houston for example. 1. Diversion: Divert through bypasses, truck/auto traffic around Madison - North and South four-6 lane highways. Consider a public/private toll way for new highways using private money instead of only tax dollars for initial building with ongoing leasing to private for-profit companies. Re-route Hwy 151 truck traffic from present (from North) E-Wash-Blair-John Nolen- Proudfit-Park Street-Beltline to Verona Rd. (From SW) 151-Verona road- South beltline-Park-W.Wash-Proudfit-John Nolen-Blair-E.Wash. Build a bypass South of Madison-McFarland/Oregon area connection from I-90, US 14, US 51 to 151 SW truck route through traffic corridor that avoids present South beltline*. *Consider and explore public private toll way partnerships so private and public monies are used to build new roads with free express bus lanes and privately operated toll ways that are leased and create a revenue stream to the county. 2. 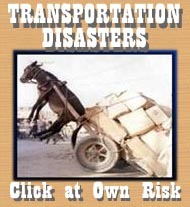 Fix the transportation systems we have now before thinking of building new ones. Repair, upgrade, build new high capacity roads that are heavily used everyday by 96% of commuters we have now. Improve the bus system that the 2% of population now uses via those road, and let individual communities in the county contract and pay for bus service as a choice- not a mandated tax increase. If we can not improve the capacity of the Isthmus roads - a defeatist argument stated in Transport 2020 report and by all the train & trolley fanatics - fine! Most of the population growth is not in Madison but in the county. Improve mobility in the County. Let Madison continue its anti-car, anti-roads, bicycles first, anti-business, anti-parkiing, ways, while crushing private property rights through zoning, and the resulting sky rocketing taxes, loss of businesses and people moving outside the city or county to escape- that is their choice to make. 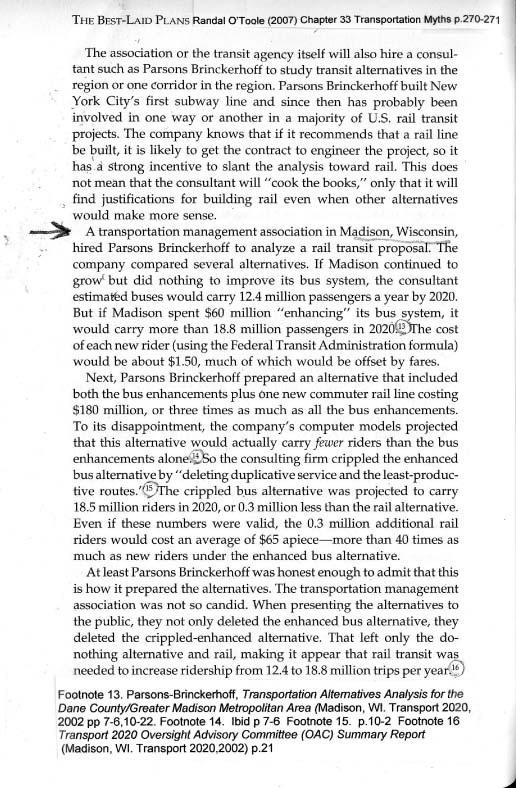 As recommended in Transport 2020 expand, enlarge, improve present bus transit system as needed in Madison and if requested, to outlying communities if they choose to fund it. De-regulate taxicab service in Madison area. Present system protects monopolies and closes off market forces for competition and lower prices, more competition. Realize Madison is not the center of the universe. Identify present commercial districts in Dane County and build transportation links to main commercial areas in the County. Madison is older, more established, but most commercial, business, cultural and job growth is outside central Madison. Transportation links should encourage mobility between these new centers and help drive the attendant economic growth. Use local zoning to control sprawl - not an expensive rail system. Transportation money is not for controlling where and how people want to live, it is to provide them mobility - PERIOD! Use local Zoning to guide new expansion new buildings and provide a minimum level of parking. Use public-private cooperation so private money is used to build, maintain and profit from parking accommodations and provide a revenue stream to the city and county.